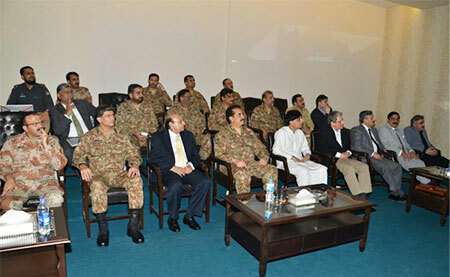 In the case of Pakistan, of the few means available to form a judgment on the state of civil-military relations, the optics of civil-military interaction remains a crucial tool; perception can also be formed on the basis of the push and pull exerted by either the civil or the military in the domains that have traditionally remained a shared space. For example, the elected Government focuses exclusively on service delivery, management of political affairs, etc., whereas management of organisational affairs of the rank and file, utilization of the Defence budget (and often its size) remain exclusive conserves of the Military. The shared space, and this is often grey and indistinguishable, includes matters of foreign policy vis-à-vis India, Afghanistan, the United States, China, etc. Both these windows of optics and decision-making on security and foreign policy management seemed to be activated during June 2016. 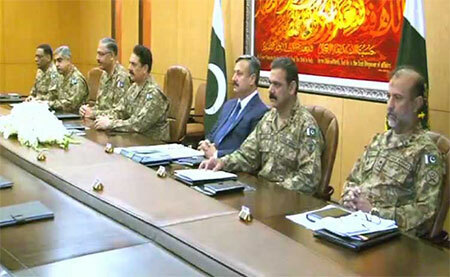 In what was aptly described by the daily Dawn as an ‘extraordinary’ huddle,1 selected Ministers of the elected Government met with Military leadership at the GHQ on June 07, 2016. 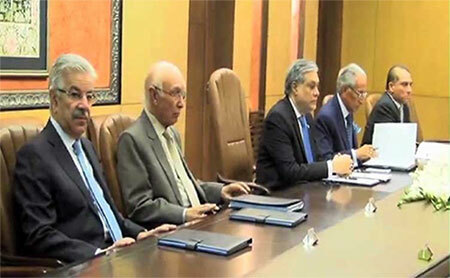 This was attended by the Federal Minister for Defence, Khawaja Muhammad Asif, MNA; Federal Minister for Finance, Senator Ishaq Dar; Advisor to the Prime Minister on Foreign Affairs, Mr. Sartaj Aziz; Special Assistant to the Prime Minister on Foreign Affairs, Mr. Tariq Fatemi; Foreign Secretary, Mr. Aizaz Ahmad Chaudhry; COAS, Gen. Raheel Sharif; Director General, Inter-Services Intelligence, Lt. Gen. Rizwan Akhtar and Director General Inter-Services Public Relations, Lt. Gen. Asim Bajwa amongst other officials. If the meeting, as the ISPR press release said was to discuss “issues related to national security” the Federal Minister for Interior, Chaudhary Nisar Ali Khan, MNA and National Security Advisor to the Prime Minister, Lt. Gen. (Retd.) Nasser Khan Janjua, seemed conspicuous by their absence. The unusual choice of the venue for the meeting highlighted the consistently ad-hoc approach to institutionalization in national security consultation exhibited by both the civil and the military leadership. The meeting to discuss “issues related to national security” should have been held under the rubric of the National Security Committee (NSC) at the NSC Secretariat rather than at the GHQ. Similarly, the Federal Ministry of Defence or the Federal Ministry of Information rather than the ISPR should have issued the Press Release for the meeting. This was the first high-level interaction between the civil-military leadership since the Prime Minister left for London on April 13, 2016 for his medical treatment. Apparently, the meeting was called by the Army to discuss various issues related to external and internal security situation of the country including CPEC, which is another sad indication on the state of affairs. With the initiative by the military, this seemed to lead credence to the somewhat firmly-held perception in the military that civilian elected governments/politicians generally create a vacuum/abdicate responsibilities on national issues where military has to fill the gap. The COAS went on to hold an exclusive meeting with Chinese Ambassador to Pakistan, Mr. Sun Weidong, at the GHQ following the civil-military huddle’s deliberations on ‘issues related to external and internal security situation of the country including CPEC’. The COAS had already visited Beijing on May 16, 2016, holding interactions with Chinese political leadership at the same time when the Afghan Chief Executive Officer, Mr. Abdullah Abdullah had been in Beijing on his first official visit to China. Recent remarks made by the Indian Prime Minister, Mr. Narendra Modi, echo the sentiments brewing in India on what we see as our civil-military relations in Pakistan and their effect on Pakistan-India relations. Within India, there is a predominant perception not only within the BJP but also across the political spectrum, that the Pakistan Military holds the veto on relationship between Pakistan and India and therefore holding talks with the Pakistani civilian leadership are not expected to yield results. They indicate that this is perhaps best exemplified by the visit of the former Indian Prime Minister, Mr. Atal Bihari Vajpayee, to Lahore in February 1999, the subsequent signing of the Lahore Declaration, and the impetus lost with the controversial Kargil debacle of May 1999, which the elected Government denied any knowledge of, leading to international humiliation for Pakistan. Similarly, in Pakistan as well, a strong perception exists that the Indian military also exercises veto over certain national security issues such as the Siachen which at one point was agreed for resolution between the two governments but the Indian military exerted pressure at the last minute to maintain the status quo. Mr. Sartaj Aziz was right in saying that across the world, the Military leadership is always consulted over matters of foreign policy.6 However, this ‘consultation’ is done by civilian elected governments through institutionalized mechanisms while elected Governments are firmly incharge on decision-making. Mr. Sartaj Aziz’s own first initiative after the PML-N Government took over in 2013 to create a NSC with a permanent secretariat which is undeniably the most-crucial policy step and much-needed, has been dormant on institutionalization in national security management in Pakistan. With the Prime Minister and the COAS meeting 76 times since the latter’s appointment in November 2013, equating to an average of 25 meetings per year, whereas the average of the meetings of the NSC stands at 1.67 per year, this reflects the unfortunate reality of lack of seriousness by the Government in taking charge of institutionalization of national security strategies and actions. Not only the dormancy of the NSC, but also of the Federal Cabinet, the Council of Common Interests, and other forums also reflects Government’s lack of priority for institutionalized decision-making. While the PML-N Government is displaying a particular penchant for making these institutions dormant, apparently the trend is more or less shared across the political spectrum where political parties represented inside the Parliament do not question, raise or debate the issue of lack of institutionalization of decision-making on security and other policies, do not offer policy options and often do not engage effectively in the Parliament and its Committees to effectively oversee the trend and advise the elected Governments prudently. At individual level, though, there are some brilliant exceptions. While no simplistic statement can convey the complexity of civil-military relations in Pakistan, it is true that most, if not all, gaps in perceptions and actions of the civil and the military leading to 4 coup d’états and numerous instances of ascendancy of military in political domain could and should have been avoided in the past, and in the future, with effective institutionalization of consultation on national security issues in Pakistan that of course have a bearing on foreign policy domains as well. While no civilized society could or should ever tolerate any military overseeing the ‘capability’ of any elected Government, it is the job of the citizens, the electorate; but it is also intrinsically crucial that elected Governments remain effectively in-charge deliver effective leadership and ably steer and utilize institutionalized forums of consultation and decision making for developing and implementing sound policies. PILDAT believes that consultation should not only take place but should also be seen to be taking place. Take the case of the Military leadership, where after every meeting of the Corp Commanders, the ISPR makes it a point to release a picture and a press release although military is not required to act as a democratic institution. This not only contributes positively towards the public’s trust in national security management, but also denotes the requisite institutionalized consultation on matters of national security. Why can’t the civil and political leadership make sure to promote institutional consultation and decision-making? It remains undeniable that the killing of Mr. Amjad Sabri, a renowned and popular singer and Qawwal, on June 22, 2016 and the abduction of the son of the Chief Justice of the Sindh High Court on June 21, 2016 were significant dents in the claims of the success of the Karachi Operation. The COAS’ visit to the headquarter of the Pakistan Rangers (Sindh) on June 26, 2016 and the subsequent civil-military meeting held at the Corp V Headquarter in Karachi the same day, are seen in that context. Once again, it is unclear as to who really is in-charge of the operation in Karachi with a roadmap, objectives and timelines, whether any attention, at all, is paid by the Parliament and Provincial Assembly of Sindh, the two forums constitutionally responsible for overseeing the Government in this domain and whether a periodic progress report is indeed sought or presented. Then the all important question is whether the Government of Sindh is working on a plan to build the capacity of the Sindh Police to a point that it is able to conduct policing duties on its own without continuing indefinitely to depend on Sindh Rangers and the armed forces for this purpose.